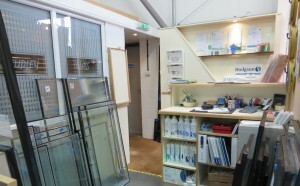 Here at Studley Glass, we offer a complete one stop shop for trade and domestic customers looking for double glazing supplies. We can supply our customers with a complete glass solution. We stock a huge range of glass related products and consumables including silicone sealants, specialist glazing tools, and reliable cleaning products. Pop in and see if we can help you find the right solution or kit you up right to get the job done properly. Studley Glass offer a free advice service for home owners who are having difficulty with any aspect of their double glazed windows or doors. If you’re a DIY home owner or even an experienced tradesman we can help you to meet the needs of your project large or small. We are always happy to help so if you require assistance, why not give us a call or pop in to our premises to discuss your requirements.